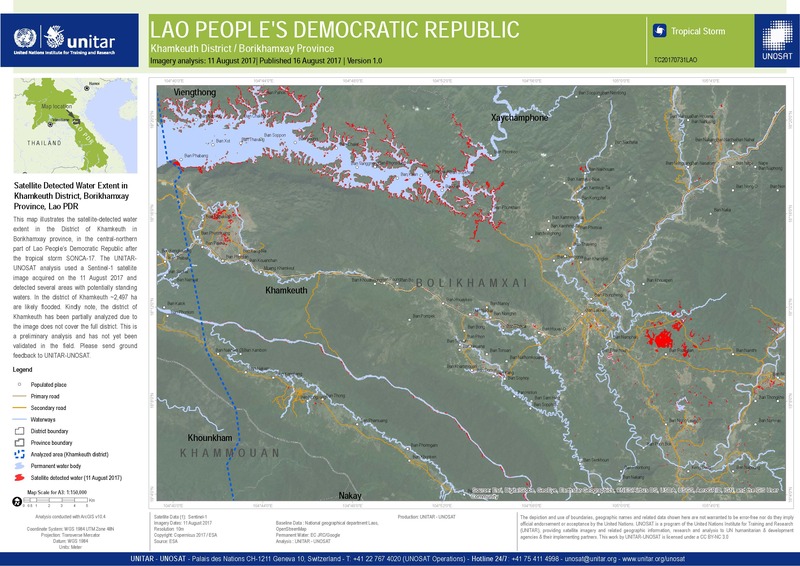 This map illustrates the satellite-detected water extent in the district of Khamkeuth in Borikhamxay province, in the central-northern part of Lao People?s Democratic Republic after the tropical storm SONCA-17. The UNITAR-UNOSAT analysis used a Sentinel-1 satellite image acquired on the 11 August 2017 and detected several areas with potentially standing waters. In the district of Khamkeuth ~2,441 ha are likely flooded. Kindly note, the district of Khamkeuth has been partially analyzed due to the image does not cover the full district. This is a preliminary analysis and has not yet been validated in the field. Please send ground feedback to UNITAR-UNOSAT.